This album is the second in a series of nine covering the complete works of Thomas Tallis (c1505-1585). As the 1540s developed, the Reformation began to take hold and the style of music required from composers such as Tallis altered radically. The large-scale melismatic votive antiphons were no longer required; the emphasis moved away from Marian devotion to a more syllabic and compact style and, eventually, to settings of English rather than Latin texts. The present album traces this development from the Jesus antiphon Sancte Deus, to the mass for four voices, the three early English anthems including If ye love me, the Te Deum for meanes and the Elizabethan Magnificat and Nunc dimittis. Tallis is dead and music dies. So wrote William Byrd, Tallis's most distinguished pupil, capturing the esteem and veneration in which Tallis was held by his fellow composers and musical colleagues in the sixteenth Century and, indeed, by the four monarchs he served at the Chapel Royal. Tallis was undoubtedly the greatest of the sixteenth Century composers; in craftsmanship, versatility and intensity of expression, the sheer uncluttered beauty and drama of his music reach out and speak directly to the listener. It is surprising that hitherto so little of Tallis's music has been regularly performed and that so much is not satisfactorily published. 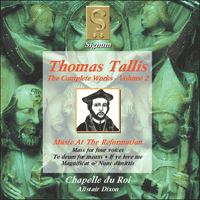 Most—conceivably all—of the music by Thomas Tallis included on this recording dates from the 1540s. It illustrates many of the ways in which Tallis and his fellow-composers responded to the enormous changes in religious ideology and practice that took place during this decade. Nothing about Tallis's early career suggests that he was destined to reach the top of his profession. Nevertheless, scarcely more than ten years separate his first known musical appointment, which was extremely humble, from his last, which could not have been more prestigious. In 1532 he was organist of the small Benedictine priory at Dover—a small-time post if ever there was one. Five years later he had moved to London, where he was employed either as a singer or as organist by the parish church of St Mary-at-Hill, which was noted for its music. In 1538 he abandoned London for the apparent security of a permanent appointment as a member of the Lady Chapel choir of the Augustinian abbey of Holy Cross at Waltham in Essex. However, the dissolution of the abbey in March 1540 left him once again without employment. In the spring of 1540 the prospects for an unemployed church musician cannot have seemed promising, but Tallis was now to make what was possibly the most consequential move of his career. A fortnight after Waltham Abbey was dissolved, Canterbury Cathedral ceased to be a Benedictine monastery; it was reorganised with a secular dean and chapter and provided with an enlarged choir (ten boys and twelve men) worthy of the cathedral's status as the fons et origo of a national church. Tallis joined the new choir during the summer of 1540 and remained one of its senior members for two or three years. These years must have been lively, not only because of the challenge of quickly assembling an impressive and extensive repertory, but also on account of the fierce disputes that arose between the conservative cathedral dignitaries and their reform-minded archbishop, Thomas Cranmer. It could have been through Cranmer, Henry VIII's most trusted counsellor during his declining years, that Tallis gained a place in the royal household chapel; the exact date of his appointment is not known, but his name occurs about half-way down the list of gentlemen (or singers) of the chapel in the lay subsidy roll of 1543/4. He remained a gentleman of the chapel for the rest of his life, rising in seniority until he became its acknowledged doyen. He may have acted as chapel organist throughout this time, although he is not referred to in this capacity until the 1570s. Apart from playing the organ, Tallis's main duty during his early years in the royal household chapel was probably the composition of music. This would have been an important responsibility, because the chapel was undoubtedly required to demonstrate how government policy on worship was meant to be interpreted in practice. Tallis and his colleagues in the royal household chapel were faced with a difficult task. The religious turmoil of the 1540s and 50s meant that composers of church music no longer worked in the atmosphere of stability and certainty that had prevailed up to about 1530. In less than two decades the religion of the country was altered four times: from 'Roman Catholicism without the Pope' under Henry VIII to an increasingly extreme Protestantism under Edward VI (1547-53), then to a restored and conservative Roman Catholicism under Mary (1553-8), and finally to a fairly moderate Protestantism under Elizabeth (1558- 1603). Composers were required not only to respond to the changes in language and liturgy that these vacillations brought about—from Mass and the Divine Office in Latin under Henry and Mary, to Communion, Mattins and Evensong in English under Edward and Elizabeth—but also to give expression to radically different ideas about the function of music in worship. The traditionalists expected music to take a prominent role by setting both liturgical and non-liturgical texts; the expert performance of elaborate music was itself an act of praise which honoured God and could help to persuade the saints to intercede on behalf of souls in purgatory. The reformers regarded music as a distraction which obscured the purpose of worship, rendered unintelligible the words which it set, and was often associated with texts whose origins, sentiments and intentions were decidedly unscriptural. It is not always easy to give precise dates to compositions written during this period. One cannot simply allocate settings of English texts to the reigns of the Protestant Edward and Elizabeth, and settings of Latin texts to those of the Catholic Henry and Mary. English translations of texts from the Latin liturgy were already being made in Henry's last years, and some of these, such as Cranmer's translation of the Litany (1544), were set to music. Conversely, the accession of a Protestant monarch did not mean that Latin texts were wholly eschewed. Latin was, after all, the international language of learning and diplomacy, and both Edward and Elizabeth were proficient in it. While it might not have been considered appropriate for contexts of worship, Latin was perfectly suitable for occasional musical compositions performed before an audience which could understand the language. Early in Elizabeth's reign there was even room for a Latin version of the English prayer-book. Published in 1560, Walter Haddon's translation was intended for use in the universities and public schools; it seems, however, to have had little success, although it may have been used at court. The Latin works on this disc pose dating problems of various kinds. The problems are greatest in the case of the five-part Magnificat and Nunc dimittis, the unique source of which is Elizabethan. In the Latin rite these canticles were sung at Vespers and Compline; in the English rite both were sung during Evensong. Paul Doe has suggested that these settings by Tallis—which were obviously intended as a pair because they have identical beginnings and share other musical material—must have been made in connection with Haddon's Latin translation of the prayerbook, since 'a Magnificat-Nunc dimittis "pair" for the old rite would have been inconceivable' (Doe, Tallis, p. 38, fn. 2). However, an inventory of polyphonic music belonging to King's College, Cambridge, in 1529 includes references to 'Walter Lambes Exultavit. Nunc dimittis off the same. … Exultavit. Also Quia viderunt.... Exultavit ffarfax. Quia viderunt off the same', while an inventory of 1522/4 from Magdalen College, Oxford, mentions two choirbooks containing 'Magnificat et Nunc Dimittis ac Antiphonarum' in five, six and seven parts. If, as these quotations imply, pre- Reformation composers had already formed the habit of pairing the two evening canticles, the date of Tallis's pair deserves reappraisal. The musical evidence is equivocal. Tallis keeps to the pre- Reformation practice of setting only the evennumbered verses in polyphony, but he ignores the traditional English conventions of scoring some verses entirely for reduced combinations of voices and incorporating a special kind of cantus firmus called a faburden. As far as their musical style is concerned, these two works contain no features that cannot be found in other music by Tallis securely datable to the 1540s. The strongest evidence for a later date is probably the very heavy reliance upon imitative writing, but there is ample precedent for this in some works certainly in existence by 1540, such as Taverner's antiphon Fac nobis secundum hoc nomen suave and Tye's Missa Sine nomine. The two four-part Latin works on this disc, Sancte Deus and the Mass for four voices, are contained in the Gyffard partbooks, a collection of music for the Latin rite compiled over several decades beginning in about 1540. Sancte Deus is a Jesusantiphon, the text of which had previously been set by John Taverner and William Whytbroke; the Gyffard partbooks also contain a setting by Philip van Wilder, a Flemish lutenist and composer who served as a chamber musician at the royal court from the early 1520s until his death in 1553. Tallis's composition has been said to reflect 'both the doctrine and musical style of about 1540' (The New Grove, Tallis'). On the other hand,Taverner's composition of this text is likely to date from about 1525, Whytbroke's cannot be much later, and official pronouncements on religion around 1540 do not seem significantly to have promoted the cause of the Jesus-antiphon. The rather wayward style of Tallis's Sancte Deus could imply a slightly earlier date, perhaps nearer 1535 than 1540. The Sancte Deus text seems to have been amalgamated, with a few minor changes, from the invocation ' Sancte Deus, sanctus fortis, sanctus et immortalis, miserere nobis' from the Improperia for Good Friday, and from the third verse, 'Nunc Christe te petimus ... redemptos' of Libera me Domine, the ninth responsory at Matins of the dead. Tallis's Mass for four voices exemplifies a kind of concise Mass setting that seems to have gained some popularity in the last ten or twelve years of Henry's reign. Surviving examples of this type are quite diverse—some are for five voices and others are for four, some are relatively ornate while others are very plain, and some are freely composed whereas others are derived from existing compositions—but they share the lack of a plainchant cantus firmus that would connect them with a particular feast. As usual in English Masses, Tallis sets the Gloria, Credo, Sanctus and Agnus. The word-setting in the first two movements is almost entirely syllabic, and since the texture is frequently homophonic the words can be heard with great clarity. It is interesting that in the Sanctus and Agnus, which of course have much shorter texts than the Gloria and Credo, Tallis achieves sufficient dimensions more through text repetition than through melismatic writing. Given that he is working with only four voices and writing in a very restrained style, Tallis creates a remarkably strong sense of variety. The polished craftsmanship reminds one of his Missa Salve intemerata, with which this Mass may be roughly contemporary. On this recording the Mass is preceded by the plainchant Conditor Kyrie which in the Latin rite was sung on major feast days. The remaining six works on this disc have English texts. Four of them—Remember not O Lord God, Hear the voice and prayer, If ye love me and Benedictus—are to be found in one or other of two important sources of early Anglican music known as the Wanley and Lumley partbooks. It is believed that both sets date from about 1546-8, and that their contents reflect the progress of Cranmer and his colleagues towards the first Book of Common Frayer (1549). The tenor book of Wanley and the bass book of Lumley are missing, which means that voices have to be recomposed where works cannot be completed from other sources; given the generally simple style of the music, recomposition is usually straightforward. Remember not, Hear the voice and prayer and If ye love me are very early examples of the Anglican anthem (the word 'anthem' had been coined two or three centuries earlier as an English version of the Latin 'antiphona'). Ali three anthems survived the Marian reaction and came back into use in Elizabeth's reign, being published in John Day's collection Certain Notes in 1560 (Day's version of Remember not is somewhat longer and more elaborate than the original version sung here and is to be found on a later disc in this series). On the evidence of these works, the anthem very early acquired formal and stylistic mannerisms, notably a preference for four-part writing and syllabic declamation, a tendency to alternate homophonic episodes with passages of simple imitation, and the habit of sectional repetition, particularly of the final section. The alternation of homophony and imitative counterpoint has precedents in some Latin works by English composers, such as Taverner's Meane Mass and Tallis's own Mass for four voices, but the fondness for repeated sections is harder to account for, unless it came from the contemporary French chanson. Interestingly, only one of Tallis's four surviving part-songs, Fond youth is a bubble, employs sectional repetition. These three anthems make different interpretations of the basic concept. Remember not is entirely chordal and includes several very short repeated sections; its text, which consists of some verses of psalm LXXIX, was evidently taken from the King's Primer of 1545. Hear the voice and prayer is considerably more ambitious, being predominantly imitative (with one very tellingly placed piece of near-homophony at 'even toward this place’, and having a lengthy repeated final section. The text is taken from Solomon's prayer at the dedication of the first temple (I Kings VIII, 28- 30), and one wonders whether the setting was intended for a particular occasion. In Certain Notes Day describes this anthem as being for children, but the written ranges imply performance by broken voices as in the other anthems. If ye love me alternates chordal and imitative sections, again with a repeated second half; the words, from John XIV, 15-17 in the translation of Coverdale's Great Bible (1539), form the beginning of the Gospel for Whitsunday in the Book of Common Prayer. Blessed be the Lord God of Israel is the English version of Benedictus Dominus Deus Israel, the canticle at Lauds in the Latin rite, which became the second canticle at Mattins in the English rite. Tallis's text is identical with that of the prayer book, except for one tiny variant. One feels that Tallis did his best to create contrast in his setting of this lengthy text, within the constraints imposed by the sobriety of the style. The imitative points are effectively varied and sometimes (as at 'And hath lifted up an horn') depict their words; the homophonic episodes provide welcome relief from the prevailing counterpoint; there is a magical change of chord to illustrate To give light to them that sit in darkness'; and, after unremittingly syllabic word-setting, the music is allowed to flower into brief melisma for the concluding 'Amen'. The earliest source of A new commandment, another four-part English anthem, dates from about 1570. It is seldom safe to argue from negative evidence, and we should not assume that this work's absence from Wanley, Lumley and Certain Notes proves that it post-dates them. It is, nevertheless, slightly less severe in style than the other anthems on this recording, allowing itself a modest amount of melisma in order to paper over the cracks between sections. The five-part Te Deum, a setting of the first canticle at Anglican Mattins, is thought to date from the late 1540s, although it survives only in a seventeenth Century source. Tallis's achievement in this work is remarkable. Consisting of a very long succession of brief and repetitive clauses, the text of the Te Deum is difficult to set to music without falling into short-windedness and incoherence. One might have thought that the plainness of the style current in England during the later 1540s would make such lapses inevitable. Yet here, with deceptively simple means, Tallis succeeds in creating a work on a grand scale with a strong sense of momentum and coherence, and in reconciling the rival demands of contrast and continuity. He is extremely imaginative in his handling of imitation, constantly changing the shape of the points and the order and distance of their entry, not just to create local contrast but also to work cumulatively upon each other. Writing in five parts rather than four—an early example of the ten part decani-cantoris texture characteristic of the Anglican 'great-service'— helps to create a feeling of monumentality, and allows the exploitation of a much greater variety of textures. Perhaps most admirable, although easy to overlook, are the sure grasp of timing and deft control of pace. This may not be the most immediately impressive music that Tallis ever wrote, but its resourcefulness and craftsmanship are exceptional. La plupart—peut-être même la totalité—de la musique de Thomas Tallis figurant dans cet enregistrement date des années 1540. Elle illustre de manière diverse la façon dont Tallis et les compositeurs ses contemporains ont réagi aux bouleversements survenus pendant cette décade au niveau du culte et de l'idéologie religieuse. Rien dans les premières années de la carrière de Tallis ne laisse à penser qu'il était destiné à atteindre le sommet de sa profession. Cependant, à peine plus de 10 ans séparent son premier emploi musical connu, à un poste des plus humbles, de son dernier, le plus prestigieux auquel il était alors possible d'aspirer. En 1532, il était organiste du petit prieuré bénédictin de Douvres—un emploi incontestablement des plus modestes. Cinq ans plus tard, on le retrouve à Londres, où il occupe un emploi d'organiste ou de choriste dans l'église paroissiale de St Mary-at-Hill, qui jouissait alors d'une excellente réputation musicale. En 1538, il abandonne Londres afin de jouir de la sécurité d'un emploi permanent dans le Choeur de la Chapelle de la Vierge (Lady Chapel choir) de l'abbaye augustinienne de la Sainte Croix à Waltham, dans le comté d'Essex. Cependant, la dissolution de l'abbaye en mars 1540 le laisse à nouveau sans emploi. Au printemps de 1540, les perspectives professionnelles pour un musicien d'église sans emploi ne pouvaient guère sembler prometteuses, mais Tallis était en fait sur le point d'obtenir un engagement qui peut être considéré comme le plus significatif de sa carrière. Quinze jours seulement après la dissolution de l'abbaye de Waltham, la cathédrale de Cantorbéry cessait elle-même d'être un monastère bénédictin; dans le cadre de sa réorganisation elle se vit dotée d'un doyen séculier et d'un chapitre, ainsi que d'un choeur plus nombreux (dix garçons et douze hommes) et plus digne du statut d'une cathédrale devenue le fons et origo d'une église nationale. Tallis obtint dans le courant de l'été 1540 un engagement dans le nouveau choeur, dont il demeura l'un des membres doyens pendant deux ou trois ans. Ces années ont dû être mouvementées, non seulement du fait des exigences professionnelles résultant du besoin de mettre en place rapidement un répertoire vaste et impressionnant, mais aussi en conséquence des conflits acerbes qui opposaient alors les dignitaires conservateurs de la cathédrale et leur archevêque partisan des réformes, Thomas Cranmer. Il est possible que ce soit grâce à l'intercession de Cranmer, qui était le conseiller le plus écouté par le roi au cours de ses années de déclin, que Tallis obtint un emploi dans la chapelle de la maison royale; la date exacte de cette nomination n'est pas connue, mais son nom apparaît vers le milieu d'une liste des 'gentlemen' (ou chanteurs) de la chapelle, dans le registre des subsides séculiers de 1543/4. Il devait en fait rester un 'gentleman' de la chapelle tout le reste de sa vie, s'élevant peu à peu jusqu'au rang de doyen incontesté. Il est possible qu'il ait occupé la position d'organiste de la chapelle dès sa nomination, mais il n'existe aucun document qui lui attribue cette fonction avant les années 1570. En plus de ses fonctions d'organiste, Tallis faisait probablement office de compositeur au cours de ses premières années à la chapelle de la maison royale. Et il s'agissait là d'une responsabilité importante, car la chapelle avait sans doute pour fonction de fournir un modèle de la manière dont la politique gouvernementale en matière de culte devait être interprétée en pratique. Tallis et ses confrères de la chapelle de la maison royale devaient donc faire face à une tâche difficile. Les bouleversements religieux des années 1540 et 1550 ne permettaient plus aux compositeurs de musique d'église de travailler dans l'atmosphère de sérénité et de stabilité qui avait prévalu jusque en 1530 environ. En moins de 20 ans, la religion nationale avait connu quatre bouleversements: de l'église 'catholique romaine sans le pape' de Henri VIII, elle était passée à un protestantisme de plus en plus extrémiste sous Edouard VI (1547-53); puis elle avait connu une restauration conservatrice du catholicisme romain sous Marie (1553-58), et pour finir un régime de protestantisme relativement modéré sous Elisabeth (1558-1603). Les compositeurs étaient requis de répondre non seulement aux changements de langue et de liturgie que ces vacillations avaient imposés—de la messe et de l'office divin en latin sous Henri et Marie à la communion, aux mâtines et aux vêpres en anglais sous Edouard et Elisabeth—mais de donner aussi une expression successive à des conceptions radicalement différentes de la fonction de la musique dans le culte. Les traditionalistes désiraient que la musique joue un rôle prééminent par la mise en musique de textes liturgiques aussi bien que non liturgiques; la virtuosité des interprétations comme le caractère élaboré de la musique constituaient en soi une forme de louange adressée à Dieu et peut-être capable de persuader les saints d'intercéder en faveur des âmes du purgatoire. Les réformateurs considéraient la musique comme une distraction susceptible d'obscurcir la fonction du culte, de rendre inintelligibles les mots du texte, et ils déploraient son association avec des textes dont les origines, ainsi que les sentiments et intentions qu'ils représentaient, étaient très clairement étrangers à l'esprit des écritures. Il n'est pas toujours facile de déterminer la date de composition exacte des oeuvres de cette époque. Il n'est pas possible d'assigner simplement la mise en musique de textes en anglais aux règnes des souverains protestants, Edouard et Elisabeth, et la mise en musique de textes latins à ceux des souverains catholiques, Henri et Marie. Des traductions en anglais des textes de la liturgie latine étaient déjà entreprises pendant les dernières années du règne de Henri, et certains de ces textes, comme la traduction par Cranmer de la Litanie (1544), furent mis en musique. Par contre, l'accession au trône d'un souverain protestant ne signifiait pas automatiquement un abandon de tous les textes en latin. Le latin demeurait après tout la langue internationale officielle de la diplomatie et de la vie intellectuelle, et Edouard comme Elisabeth le parlaient couramment. Même s'il n'était pas considéré comme propre à constituer la langue du culte, le latin demeurait un véhicule adéquat pour la composition de pièces de circonstances destinées à être interprétées devant un public capable de le comprendre. Au cours des premières années du règne d'Elisabeth, il s'est même fait une version latine du livre de prières anglais. Publiée en 1560, la traduction de Walter Haddon était destinée à être utilisée dans les universités et les écoles privées; elle semble cependant n'avoir connu qu'un succès très modeste, bien qu'il soit possible qu'elle ait été utilisée à la cour. Les oeuvres en latin figurant dans ce disque posent divers problèmes de datation. Les problèmes les plus sérieux se posent pour le Magnificat à cinq voix et le Nunc dimittis, dont la source unique date du règne d'Elisabeth. Dans le cadre de la liturgie latine, ces cantiques étaient chantés à l'occasion des vêpres et des complies; dans la liturgie anglaise, ils étaient tous deux chantés pendant les vêpres. Paul Doe a suggéré que ces mises en musique par Tallis—qui étaient évidemment destinées à former une paire, car elles ont un commencement identique et ont en commun divers éléments musicaux—ont dû être faites en connexion avec la traduction latine du livre de prières de Haddon, car 'une "paire" constituée du Magnificat et du Nunc dimittis était inconcevable dans le cadre de la liturgie ancienne' (Doe, Tallis, p. 38, note 2). Cependant un inventaire de la musique polyphonique appartenant à King's College à Cambridge, et datant de 1529, inclut des références à 'Walter Lambes Exultavit. Nunc dimittis du même … Exultavit. Aussi Quia viderunt…Exultavit ffarfax. Quia viderunt du même'. Tandis qu'un inventaire datant de 1522/4, et provenant de Magdalen College à Oxford, mentionne deux livres de chants contenant 'Magnificat et Nunc Dimittis ac Antiphonarum' à cinq, six et sept voix. Si, comme les documents que nous venons de citer le suggèrent, les compositeurs de l'époque antérieure à la réforme avaient déjà pour habitude de grouper en paire les deux cantiques des vêpres, la date de composition de l'oeuvre de Tallis demande à être réexaminée. Les indices proprement musicaux ne fournissent pas d'arguments décisifs. Tallis s'en tient à la méthode datant d'avant la réforme et qui consiste à ne mettre en musique polyphonique que les versets pairs, mais il ignore les conventions traditionnelles dans la musique anglaise qui exigent que certains versets soient destinés à être chantés par un nombre réduit de voix et que soit incorporé un type spécial de cantus firmus appelé faburden. En ce qui concerne le style musical, ces deux oeuvres ne contiennent aucun élément qui ne se retrouve pas déjà dans les autres oeuvres de Tallis qui peuvent être datées avec certitude des années 1540. La principale raison qui pousse à opter pour une date plus récente est l'importance de la composition imitative, mais il existe de nombreux précédents en la matière dont la composition précède 1540, comme l'antienne de Taverner Fac nobis secundum hoc nomen suave et le Missa Sine Nomine de Tye. Les oeuvres en latin à quatre voix figurant dans le disque, le Sancte Deus et la Mass for four voices, se trouvent dans le livre musical de Gyffard, une collection d'oeuvres musicales destinées à la liturgie latine et compilées pendant une période de plusieurs décennies à partir des années 1540. Le Sancte Deus est une antienne consacrée à Jésus dont le texte avait déjà fait l'objet d'une mise en musique par John Taverner et William Whytbroke; le livre musical de Gyffard contient aussi une mise en musique par Philip van Wilder, un compositeur et luthiste flamand qui occupait les fonctions de musicien de chambre à la cour royale du début des années 1520 jusqu'à sa mort en 1553. Il a été dit que la composition de Tallis reflète 'à la fois le style musical et les doctrines des années 1540' (The New Grove, Tallis'). D'autre part, la mise en musique de ce texte par Taverner date probablement de 1525 environ et celle de Whytbroke ne peut guère être beaucoup plus récente, et les déclarations officielles en matière de religion aux alentours des années 1540 ne semblent susceptibles de promouvoir la composition d'une antienne consacrée à Jésus. Le style quelque peu rétif du Sancte Deus de Tallis indique peut-être une date légèrement antérieure, plus proche de 1535 que de 1540. Le texte du Sancte Deus semble résulter d'un amalgame, avec quelques changements mineurs, entre l'invocation 'Sancte Deus, sanctus fortis, sanctus et immortalis, miserere nobis' du Improperia pour le Vendredi Saint, et du troisième verset, 'Nunc Christe te petimus…redemptos' du Libera me Domine, le neuvième répons des matines des morts. La Mass for four voices de Tallis est un exemple du style de mise en musique concis de la Messe don’t la popularité semble avoir augmenté au cours des dix ou douze dernières années du règne de Henri. Les exemples de ce type de composition ayant survécu sont très divers—quelques-uns sont à quatre voix et d'autres à cinq voix, certains sont de style ornementé tandis que d'autres sont plutôt dépouillés et certains sont composés librement sans modèle tandis que d'autres sont dérivés de compositions existantes—mais ils ont en commun l'absence du plain chant cantus firmus qui les associerait à une célébration particulière. Comme il est de coutume dans les Messes anglaises, Tallis met en musique le Gloria, le Credo, le Sanctus et l'Agnus. La mise en musique dans les deux premiers mouvements est presque entièrement syllabique, et comme la texture est très souvent homophone, les mots se détachent avec une très grande clarté. Il est intéressant de noter que dans le Sanctus et l'Agnus, dont les textes sont bien entendu beaucoup plus courts que ceux du Gloria et du Credo, Tallis parvient à la longueur désirée plus par répétition du texte que par le chant de plusieurs notes sur une seule syllabe. Compte tenu du fait qu'il ne travaille qu'avec quatre voix et qu'il compose dans un style très dépouillé, Tallis parvient à créer une remarquable impression de variété. La maîtrise technique de la composition évoque celle de sa Missa Salve intemerata, dont la composition doit être à peu près contemporaine de celle de la Messe qui nous occupe. Dans cet enregistrement, la Messe est précédée du plain chant Conditor Kyrie qui dans la liturgie latine était chanté dans les grandes occasions. Les six autres pièces de cet enregistrement ont toutes des textes en anglais. Quatre d'entre elles—Remember not O Lord God (Ne te souviens pas O mon seigneur), Hear the voice and prayer (Entends la voix et la prière), If ye love me (Si tu m'aimes) et Benedictus—se retrouvent dans l'une ou l'autre de deux sources importantes pour la musique anglicane ancienne qui sont connues sous les noms de livres de musique de Wanley et de Lumley. On considère que ces deux documents datent d'environ 1546-8 et que leur contenu reflète le progrès accompli par Cranmer et ses collègues dans la direction du Livre de prière commune (1549). La partition pour ténor du livre de Wanley et la partition de basse du livre de Lumley manquent, ce qui signifie que la musique pour ces voix a dû être réécrite lorsqu'il n'a pas été possible de reconstituer les parties manquantes à partir d'autre sources. Etant donné la simplicité générale du style de composition, le travail de restitution n'a pas cependant présenté de grande difficulté. Remember not, Hear the voice and prayer et If ye love me sont des exemples très anciens d'antiennes (anthem) anglicans (le mot 'anthem' ayant été introduit deux à trois siècles auparavant comme la version anglaise du latin 'antiphona'). Ces trois antiennes survécurent à la réaction qui a marqué le règne de Marie et furent à nouveau utilisées sous le règne de Elisabeth, et publiées dans la collection de John Day Certain Notes en 1560 (la version du Remember not donnée par Day est quelque peu plus longue et complexe que la version originale qui est chantée ici, et elle figure dans un des disques ultérieurs de la présente série). Sur la base de ces oeuvres, on peut conclure que le genre de l'antienne a acquis très tôt un certain nombre de maniérismes stylistiques et formels, en particulier une préférence pour la composition à quatre voix et la déclamation syllabique, une tendance à faire alterner les épisodes homophones avec des passages de simple imitation, et une tendance à la répétition des sections, en particulier les sections de la fin. On trouve des précédents à l'alternance de l'homophonie et du contrepoint imitatif dans certaines des oeuvres en latin de compositeurs anglais, comme la Meane Mass de Taverner et la Mass for four voices de Tallis lui-même, mais il est difficile de rendre compte du goût évident pour les répétitions de sections, à moins que l'origine n'en soit la 'chanson' française contemporaine. Il est intéressant de noter qu'une seule des quatre chansons polyphoniques de Tallis à avoir survécues, Fond youth is a bubble (La jeunesse aimante est une bulle), utilise cette technique de répétition de sections. Ces trois antiennes offrent des interprétations contrastées du concept de base. Remember not est composé presque entièrement sur accords et il inclut plusieurs sections répétées très courtes. Son texte, constitué par quelques-uns des versets du psaume LXXIX, est évidemment tiré du King's Frimer de 1545. Hear the voice and prayer est une composition bien plus ambitieuse, étant essentiellement imitative (avec un morceau de quasi-homophonie placé à un endroit particulièrement révélateur sur la ligne 'even toward this place'), avec une section finale longue et répétée. Le texte est tiré de la prière de Salomon lors de la consécration du premier temple (I Rois VIII, 28-30), et il est possible de se demander si la mise en musique était destinée à une occasion spéciale. Dans Certain Notes, Day décrit cette antienne comme devant être chantée par des enfants, mais la tessiture de la composition requiert une interprétation par des voix adultes comme pour les autres antiennes. If ye love me fait alterner les sections sur accords et les sections imitatives, avec à nouveau une répétition de la deuxième partie; le texte, tiré de Jean XIV, 15-17 dans la traduction de Coverdale de la Grande Bible (1539), forme le début de l'évangile du dimanche de la Pentecôte dans le Livre de prière commune. Blessed be the Lord God of Israël est la version anglaise du Benedictus Dominus Deus Israël, le cantique des Laudes dans la liturgie latine, qui est devenu le second cantique des matines dans la liturgie anglaise. Le texte de Tallis est identique à celui du livre de prière à l'exception d'une seule variation minime. On a le sentiment que Tallis s'est efforcé de créer un contraste dans la mise en musique de ce texte long et dans les limites imposées par la sobriété de son style. Les sections imitatives sont variées de manière convainquante et quelquefois (comme dans la ligne 'And hath lifted up an horn') constitue une description des mots; les épisodes homophoniques marquent une pause entre les sections de contrepoint qui dominent la pièce; un changement d'accent magique est ménagé pour illustrer 'To give light to them that sit in darkness' ; et à la fin d'une oeuvre résolument syllabique, il est donné à la richesse musicale une occasion de bref épanouissement dans la suite de notes chantées sur les syllabes du 'Amen' de la conclusion. La source la plus ancienne de A new commandment, une autre antienne en anglais à quatre voix, date d'environ 1570. Il est rarement justifié de raisonner sur la base d'une absence, et nous ne conclurons donc pas que l'absence de cette oeuvre dans les collections Wanley, Lumley et Certain Notes prouve que sa composition est ultérieure. Il est cependant composé dans un style légèrement moins austère que celui des autres antiennes qui figurent dans cet enregistrement, se permettant de courts passages de variations mélodiques sur une syllabe pour assurer l'enchaînement entre les sections. Le Te Deum à cinq voix, une mise en musique du premier cantique des matines anglicanes, est en général daté de la fin des années 1540, bien qu'il n'ait survécu que dans une source datant du dixseptième siècle. La réussite de Tallis dans cette oeuvre est remarquable. Le texte du Te Deum, qui est composé d'une longue succession de phrases brèves et répétitives, est particulièrement difficile à mettre en musique sans succomber à la dispersion et à l'incohérence. Il est même tentant de penser que l'austérité du style prévalent en Angleterre vers la fin des années 1540 contribue à rendre ces défauts inévitables. Et cependant, avec très peu de moyens, Tallis parvient à créer une oeuvre de grande ampleur qui se déploie avec dynamisme et cohérence et qui réconcilie parfaitement les exigences contraires de contraste et de continuité. Il est très imaginatif dans son utilisation de l'imitation, changeant sans cesse le contour musical de chaque point ainsi que l'ordre et la distance de leur entrée, non seulement pour créer des contrastes mais aussi pour obtenir des effets cumulatifs de l'un sur l'autre. Composant pour cinq voix plutôt que quatre—un des exemples les plus anciens de la texture à dix voix decani-cantoris caractéristique de la 'grande messe' anglicane—aide à susciter un sentiment de monumentalité et permet l'exploitation d'une plus grande variété de textures. Ce qu'il y a peut-être de plus admirable, encore que l'effet en soit discret et passe facilement inaperçu, est son sens très sûr du moment opportun et sa grande maîtrise du rhythme. Il ne s'agit peut-être pas là de la musique la plus immédiatement impressionnante que Tallis ait jamais écrite, mais la maîtrise et la créativité dont il fait montre sont exceptionnels. Ein Großteil—vielleicht sogar alle—der Kompositionen von Thomas Tallis auf dieser Aufnahme entstanden in den 1540ern. Sie illustrieren auf verschiedene Weisen, wie Tallis und andere Komponisten seiner Zeit auf die enormen Veränderungen dieses Jahrzehnts in religiöser Ideologie und Praxis reagierten. Die Anfänge seiner Laufbahn deuteten kaum darauf hin, daß Tallis einst ganz an der Spitze seiner Kunst stehen würde. Und dennoch liegen kaum zehn Jahre zwischen seiner ersten (uns bekannten) musikalischen Anstellung, die ausgesprochen bescheiden war, und seiner letzten, die kaum ehrenreicher hätte sein können. Im Jahr 1532 war er Organist eines kleinen benediktinischen Klosters in Dover—ein äußerst niedriger Posten. Fünf Jahre später zog Tallis nach London, wo er entweder als Sänger oder Organist an der Gemeindekirche St Mary-at-Hill, bekannt für ihre Musik, angestellt war. Schon 1538 verließ er London und trat die vermeintlich sichere Stellung als Mitglied des Chors der Marienkapelle der augustinischen Abtei Holy Cross in Waltham, Essex, an. Durch die Auflösung dieser Abtei im März 1540 verlor er jedoch schon bald wieder seine Arbeit. Im Frühjahr 1540 können die Aussichten eines entlassenen Kirchenmusikers kaum vielversprechend gewesen sein, aber Tallis erhielt zu diesem Zeitpunkt das wahrscheinlich bedeutendste Angebot seiner Laufbahn. Nur 14 Tage nach der Auflösung der Abtei in Waltham verlor Canterbury Cathedral ihren Status als benediktinisches Kloster und wurde unter einem sekulären Dekan und Domkapitel neu organisiert. Außerdem erhielt sie einen größeren Chor aus zehn Knaben und zwölf Männern, der dem Status der Kathedrale als fons et origo einer nationalen Kirche Ehre machen würde. Tallis trat diesem neuen Chor im Sommer 1540 bei und blieb zwei oder drei Jahre lang eines seiner führenden Mitglieder. Diese Jahre müssen recht abwechslungsreich gewesen sein—nicht nur aufgrund der Herausforderung, in Eile ein eindrucksvolles und umfassendes Repertoire zusammenzustellen, sondern auch wegen der bitteren Dispute zwischen den konservativen Würdenträgern der Kathedrale und dem reformistisch gesinnten Erzbischof Thomas Cranmer. Vielleicht war es durch Vermittlung Cranmers, den vertrautesten Berater des Königs in seinen letzten Regierungsjahren, daß Tallis eine Anstellung in der königlichen Hauskapelle gewinnen konnte. Das genaue Datum seiner Ernennung ist nicht bekannt, aber sein Name erscheint ungefähr in der Mitte der Liste der Gentlemen (d.h. Sänger) der Kapelle im Laien-Lohnverzeichnis von 1543/4. Er blieb für den Rest seines Lebens ein Gentleman der Kapelle, stieg weiter auf und wurde letztendlich ihr anerkannter Rangältester. Er war während dieser Zeit möglicherweise Organist der Kapelle, obwohl er erst in den I570ern als solcher erwähnt wird. Neben dem Spielen der Orgel bestand seine Aufgabe zu Beginn seiner Jahre an der königlichen Hauskapelle wahrscheinlich im Komponieren von Musik. Dies muß eine bedeutende Verantwortung gewesen sein, da die Kapelle zweifellos demonstrieren sollte, wie die Anweisungen der Regierung in Bezug auf Gottesdienste in die Praxis umzusetzen waren. Tallis und seine Kollegen an der königlichen Hauskapelle sahen sich einer schwierigen Aufgabe gegenübergestellt. Die religiösen Wirrungen der 40er und 50er Jahre des 16. Jahrhunderts führten dazu, daß Komponisten von Kirchenmusik nicht länger in einem stabilen, sicheren Umfeld arbeiteten, wie sie es bis etwa 1530 genossen hatten. In weniger als zwei Jahrzehnten wurde die Religion des Landes viermal geändert: vom 'Römischen Katholizismus ohne Papst' unter Henry VIII zu einem zunehmend extremen Protestantismus unter Edward VI (1547-53), dann zum wiederhergestellten, konservativen Katholizismus unter Mary (1553-8) und schließlich zu einem relativ gemäßigten Protestantismus unter Elizabeth (1558-1603). Komponisten mußten nicht nur auf die durch diese Schwankungen hervorgerufenen Änderungen von Sprache und Liturgie reagieren—von der Messe und dem Brevier in Latein unter Henry und Mary, bis zu Kommunion, Morgenliturgie und Abend-gottesdienst in Englisch unter Edward und Elizabeth—sondernauch den radikal unterschiedlichen Vorstellungen von der Rolle der Musik im Gottesdienst Ausdruck verleihen. Die Traditionalisten betrachteten Musik als zentrales Element und vertonten sowohl liturgische als auch andere Texte. Für sie war die kunstvolle Vorführung von Musik eine Lobpreisung Gottes und konnte dazu beitragen, die Heiligen gütig zu stimmen und als Fürsprecher für Seelen im Fegefeuer zu gewinnen. Die Reformisten hielten Musik für eine Ablenkung, die den wahren Sinn des Gottesdienstes vertuschte, die gesungenen Worte unverständlich machte und oft mit Texten in Verbindung stand, deren Ursprünge, Gesinnungen und Absichten ausgesprochen unbiblisch waren. Kompositionen aus dieser Zeit können nicht immer präzise datiert werden. Es ist nicht möglich, Vertonungen englischer Texte einfach den Regierungszeiten der Protestanten Edward und Elizabeth zuzuschreiben und die Vertonungen lateinischer Texte der Herrschaft der Katholiken Henry und Mary. Englische Übersetzungen von Texten der latenischen Liturgie wurden schon in den letzten Jahren Henrys angefertigt, und einige davon—wie z.B. Cranmers Übersetzung der Litanei (1544)— wurden vertont. Umgekehrt bedeutete die Thronbesteigung eines protestantischen Monarchen noch lange nicht, daß lateinische Texte völlig gemieden wurden. Latein war schließlich die internationale Sprache der Gelehrtheit und Diplomatie, und sowohl Edward als auch Elizabeth waren darin sehr geübt. Während Latein vielleicht als unangemessen für Gottesdienste galt, war es durchaus angemessen für gelegentliche Kompositionen, aufgeführt für Zuhörer, die die Sprache beherrschten. Zu Beginn der Herrschaft Elizabeths wurde sogar eine lateinische Version des englischen Gebetsbuchs geduldet. Die 1560 veröffentlichte Übersetzung von Walter Haddon war für Universitäten und Privatschulen gedacht, hatte aber anscheinend nur wenig Erfolg, obwohl sie möglicherweise am Hof verwendet wurde. Die lateinischen Werke auf dieser CD lassen sich aus verschiedenen Gründen schwer datieren. Diegrößten Probleme bietet das fünfstimmige Magnificat und Nunc dimittis, deren einzige Quelle elisabethanisch ist. Im lateinischen Ritus wurden diese Lobgesänge anläßlich der Vesper und des Komplets gesungen; im englischen Ritus beide während des Abendgottesdienstes. Paul Doe hat vorgeschlagen, daß diese Vertonungen von Tallis—die offensichtlich als Paar angelegt sind, weil sie identisch beginnen und andere musikalische Elemente gemeinsam haben—in Verbindung mit Haddons lateinischer Übersetzung des Gebetsbuches entstanden sein müssen, da 'ein Paar aus Magnificat und Nunc dimittis für den alten Ritus unvorstellbar gewesen wäre' (Doe: Tallis, S. 38, Fußnote 2). Ein Verzeichnis polyphonischer Musik des King's College, Cambridge, von 1529 enthält jedoch Verweise auf 'Walter Lambes Exultavit. Nunc dimittis off the same. ... Exultavit. Also Quia viderunt. ...Exultavit ffarfax. Quia viderunt off the same', während ein Verzeichnis von 1522/4 von Magdalen College, Oxford, zwei Chorbücher erwähnt mit 'Magnificat et Nunc Dimittis ac Antiphonarum' für fünf, sechs und sieben Stimmen. Wenn Komponisten—wie diese Zitate andeuten—wirklich schon vor der Reformation gewohnt waren, die beiden Abendlobgesänge in Paaren zusammenzufassen, dann sollte die Datierung von Tallis' Paar vielleicht neu überdacht werden. Die musikalischen Beweise sind widersprüchlich. Tallis hält sich an die vorreformistische Gewohnheit, nur die geraden Versnummern polyphonisch zu vertonen, aber er ignoriert die traditionellen englischen Konventionen, einige Verse ganz für verringerte Stimmkombinationen zu vertonen und eine spezielle Art von Cantus firmus ('Faburden' genannt) einzubeziehen. Hinsichtlich ihres musikalischen Stils enthalten die beiden Werke keine Elemente, die nicht auch in anderen, definitiv den 1540er Jahren zuzuschreibenden Kompositionen Tallis' auftreten. Das überzeugendste Argument für ein späteres Datum ist wahrscheinlich das sehr starke Element imitativer Komposition, aber auch dafür gibt es umfangreiche Beispiele in einigen Werken, die mit Sicherheit vor 1540 entstanden, wie z.B. Taverners Antiphon Fac nobis secundum hoc nomen suave und Tyes Missa Sine nomine. Die zwei vierstimmigen lateinischen Werke auf dieser CD—Sancte Deus und die Mass for four voices—befinden sich in den Gyffard Partbooks, eine ca. 1540 begonnene und mehrere Jahrzehnte umfassende Sammlung von Musikwerken für den lateinischen Ritus. Sancte Deus ist eine Jesus-Antiphon, deren Text zuvor bereits von John Taverner und William Whytbroke vertont worden war. Die Gyffard Partbooks enthalten auch eine Vertonung von Philip van Wilder, einem flämischen Lautenspieler und Komponisten, der von den frühen 1520ern bis zu seinem Tod im Jahr 1553 als Kammermusiker am königlichen Hof angestellt war. Von Tallis' Komposition wird gesagt, daß sie 'sowohl die Doktrin als auch den musikalischen Stil von etwa 1540' reflektiere (The New Grove, 'Tallis'). Andererseits stammt Taverners Komposition zu diesem Text wahrscheinlich aus dem Jahr 1525. Whytbrokes kann nicht viel später entstanden sein, und die offiziellen Erklärungen zur Religion um 1540 scheinen die Interessen der Jesus-Antiphon kaum unterstützt zu haben. Der recht unstete Stil von Tallis' Sande Deus könnte auf ein etwas früheres Datum hinweisen, vielleicht eher 1535 als 1540. Der Text der Sancte Deus scheint mit einigen geringen Veränderungen aus der Invokation 'Sancte Deus, sanctus fortis, sanctus et immortalis, miserere nobis' der Improperia für Karfreitag und dem dritten Vers 'Nunc Christe te petimus … redemptos' aus Libera me Domine, dem neunten Responsorium der Morgenliturgie für die Toten, zusammengestellt worden sein. Tallis' Mass for four voices dient als Beispiel für eine Art schlichter Messe-Vertonungen, die in den letzten zehn oder zwölf Jahren der Herrschaft Henrys VIII sehr an Popularität gewonnen zu haben scheinen. Überlieferte Beispiele dieses Typs sind recht verschiedenartig—einige für fünf Stimmen und andere für vier, einige relativ ausgeschmückt und andere sehr einfach, einige frei komponiert und andere existierenden Kompositionen entlehnt. Allen fehlt jedoch ein Cantus firmus, der sie mit einem besonderen Kirchenfest verbinden würde. Gemäß der Tradition der englischen Messe vertont Tallis das Gloria, Credo, Sanctus und Agnus. Die Wortvertonung der ersten beiden Sätze ist fast völlig syllabisch, und da der Aufbau oft homophon ist, sind die Worte sehr klar verständlich. Interessanterweise erzielt Tallis im Sanctus und Agnus, deren Texte natürlich sehr viel kürzer sind als im Gloria und Credo, mehr durch Textwiederholung als durch melismatische Komposition befriedigende Vielschichtigkeit. Wenn man bedenkt, daß er mit nur vier Stimmen und in einem sehr zurückhaltenden Stil arbeitet, gelingt es Tallis, einen erstaunlich starken Eindruck von Vielfalt zu erzeugen. Die ausgereifte Kunstfertigkeit erinnert an seine Missa Salve intemerata, die etwa zur gleichen Zeit wie seine Messe entstanden sein könnte. Auf dieser Aufnahme folgt die Messe dem Cantus planus Conditor Kyrie, der im lateinischen Ritus zu bedeutenden Kirchenfesten gesungen wurde. Die restlichen sechs Werke auf dieser CD haben englische Texte. Vier davon—Remember not O Lord God, Hear the voice and prayer, If ye love me und Benedictus—lassen sich jeweils in einer von zwei wichtigen Quellen früher anglikanischer Musik—den Wanley und Lumley Partbooks— finden. Es wird angenommen, daß beide Sammlungen von Stimmpartien ungefähr aus den Jahren 1546-8 stammen und daß ihr Inhalt die Fortschritte von Cranmer und seinen Kollegen bei der Arbeit am ersten Book of Common Prayer (Buch des gemeinsamen Gebets—1549) reflektiert. Das Tenorbuch von Wanley und das Baßbuch von Lumley sind nicht erhalten, was bedeutet, daß diese Stimmen neu komponiert werden mußten, wenn die Werke nicht aus anderen Quellen vervollständigt werden konnten. Angesichts des durchgehend einfachen Stils der Musik istdie Neukomposition jedoch im allgemeinen recht unkompliziert. Remember not, Hear the voice and prayer und If ye love me sind sehr frühe Beispiele des anglikanischen Anthem bzw. Der Chorhymne (der Begriff 'Anthem' wurde zwei oder drei Jahrhunderte vorher als englische Version des lateinischen 'Antiphona' geprägt). Alle drei Chorhymnen überlebten die Rückkehr zum Katholizismus unter Mary und kamen unter Elizabeth wieder in allgemeinen Gebrauch. Sie wurden 1560 in John Days Sammlung Certain Notes veröffentlicht (Days Version von Remember not ist etwas länger und komplizierter als die hier gesungene Originalversion und wird auf einer späteren CD in dieser Serie erscheinen). Aus diesen Werken läßt sich schließen, daß die Chorhymne sehr früh formale und stilistische Manierismen aufwies, dabei vor allem eine Vorliebe für vierstimmige Komposition und syllabische Deklamation, eine Neigung zur Abwechslung homophoner und einfach imitativer Passagen sowie die Angewohnheit abschnittweiser Wiederholung, vor allem im letzten Teil. Die Abwechslung von Homophonie und imitativem Kontrapunkt trat schon in einigen lateinischen Werken englischer Komponisten auf, wie z.B. in Taverners Meane Mass und Tallis' eigener Mass for four voices, aber die Beliebtheit wiederholter Passagen ist weniger leicht zu erklären, obwohl sie vielleicht vom zeitgenössischen französischen Chanson stammt. Interessanterweise weist nur eines der vier überlieferten mehrstimmigen Lieder von Tallis—Fond youth is a bubble— abschnittweise Wiederholung auf. Diese drei Chorhymnen stellen unterschiedliche Interpretationen des gleichen Grundkonzeptes dar. Remember not ist völlig akkordisch aufgebaut und enthält mehrere sehr kurze wiederholte Passagen. Der Text, der aus einigen Versen des Psalms 79 besteht, wurde offensichtlich dem King's Primer von 1545 entnommen. Hear the voice and prayer ist sehr viel ehrgeiziger. Dieses Werk ist vorwiegend imitativ (mit einem sehr vielsagend plazierten, nahezu homophonen Abschnitt bei 'even toward this place') und besitzt einen sehr langen, wiederholten Schlußteil. Der Text wurde Salomons Gebet anläßlich der Einweihung des ersten Tempels entnommen (Erstes Buch der Könige VIII, 28-30). Man fragt sich, ob diese Vertonung für einen bestimmten Anlaß gedacht war. In Certain Notes beschreibt Day diese Chorhymne als ein Werk für Kinder, aber die niedergeschriebenen Stimmlagen deuten auf Männerstimmen hin, wie auch bei den anderen Chorhymnen. In If ye love me wechseln sich akkordische und imitative Abschnitte ab, wiederum mit einer wiederholten zweiten Hälfte. Die Worte, aus Johannes XIV, 15-17, in der Übersetzung von Coverdales Great Bible (1539), bilden den Anfang des Evangeliums für Pfingstsonntag im Book of Common Prayer. Blessed be the Lord God of Israel ist die englische Version des Benedictus Dominus Deus Israel, dem Lobgesang der Laudes im lateinischen Ritus, der als zweiter Lobgesang in die Morgenliturgie des englischen Ritus aufgenommen wurde. Bis auf eine kleine Ausnahme ist Tallis' Text identisch mit dem des Gebetsbuches. Es scheint, als habe Tallis versucht, bei der Vertonung dieses langen Textes so viel Kontrast zu schaffen, wie es ihm innerhalb der Einschränkungen durch die Nüchternheit des Stils möglich war. Die imitativen Punkte werden wirkungsvoll variiert und bilden manchmal (wie bei 'And hath lifted up an horn') die Worte nach; die homophonen Passagen bieten willkommene Abwechslung von dem vorherrschenden Kontrapunkt; die Worte To give light to them that sit in darkness' werden durch einen magischen Akkordwechsel illustriert und nach einer unnachgiebig syllabischen Wortvertonung läßt er die Musik für das abschließende 'Amen' in einem kurzen Melisma aufblühen. Die früheste Quelle von A new commandment (ebenfalls eine vierstimmige englische Chorhymne) läßt sich ungefähr auf 1570 datieren. Aus negativen Hinweisen lassen sich nur selten zuverlässige Schlüsse ziehen, und wir sollten das Fehlen dieses Werks in Wanley, Lumley und Certain Notes nicht als definitiven Beweis betrachten, daß es deshalb später entstanden sein muß. Im Stil ist es jedoch etwas weniger streng als dieanderen Chorhymnen dieser Aufnahme und erlaubt sich ein gewisses Maß an Melisma, um die Schnittstellen zwischen den einzelnen Passagen zu überbrücken. Das fünfstimmige Te Deum ist eine Vertonung des ersten Lobgesangs der anglikanischen Morgenliturgie und entstand vermutlich in den späten 1540ern, obwohl es nur als ein Manuskript aus dem 17. Jahrhundert erhalten ist. Tallis' Leistungen in diesem Werk sind bemerkenswert. Der Text des besteht aus einer sehr langen Folge kurzer, sich wiederholender Sätze und läßt sich nur schwer vertonen, ohne dabei kurzatmig und zusammenhanglos zu wirken. Man sollte meinen, daß der in den späten 1540ern in England vorherrschende, schlichte Stil solche Mängel unvermeidlich machen würde, aber Tallis ist es hier mit täuschend einfachen Mitteln gelungen, ein groß angelegtes Werk mit einem ausgesprochen starken Gefühl von treibendem Schwung und klarem Zusammenhang zu schaffen und die gegensätzlichen Anforderungen von Kontrast und Kontinuität in harmonischen Einklang zu bringen. Seine Handhabung der Imitiation—die fortlaufende Veränderung der Punkte sowie der Reihenfolge und des Abstandes ihres Eintritts—zeugt von großem Einfallsreichtum, und dies bewirkt nicht nur lokalen Kontrast, sondern auch einen wechselwirkenden, kumulativen Effekt. Das Vertonen für fünf Stimmen statt nur vier—ein frühes Beispiel der charakteristischen zehnstimmigen 'decani-cantoris'-Struktur des anglikanischen 'Hochgottesdienstes'—trägt zu seiner monumentalen Wirkung bei und ermöglicht die Auschöpfung einer weit größeren Vielfalt von Strukturen. Am bewunderns wertesten—obwohl leicht zu übersehen—ist jedoch das sichere Gefühl für zeitliche Koordinierung und die geschickte Manipulation des Tempos. Dies ist vielleicht nicht unbedingt die unmittelbar eindrucksvollste Musik, die Tallis je komponiert hat, aber sein Einfallsreichtum und seine Kunstfertigkeit sind etwas ganz Besonderes.